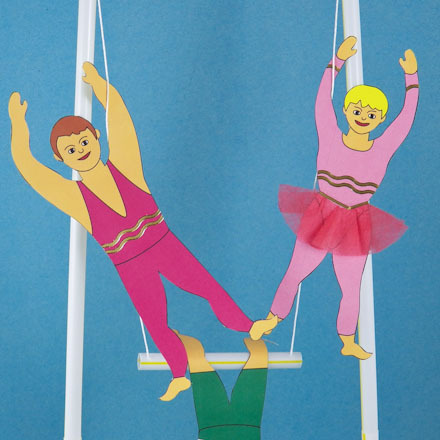 In this project, you will make circus trapeze performers and a trapeze. 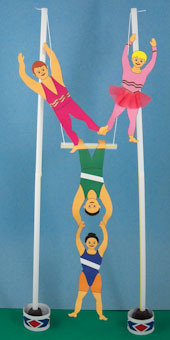 The trapeze act goes together with the other craft projects featured in the Under the Big Top craft series. For more crafting fun, you can decorate the trapeze artists using the ideas and techniques introduced in the Decorative Craft series. The trapeze in this project is made from simple materials and is very lightweight. It is good for display or light make-believe play. If you want a more substantial trapeze for regular play, you'll need to fashion a trapeze stand from wood or heavy wire. You could do something as simple as sticking dowel rods in empty cans filled with gravel. Of course, be crafty and paint the cans and dowel rods with circus designs. Related crafts: This is the fourth of four craft projects in the Under the Big Top craft series. 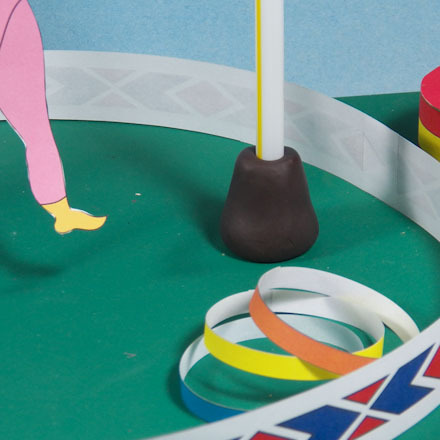 Make all of the craft projects for a complete three-ring circus! This project is rated EASY to AVERAGE to do. 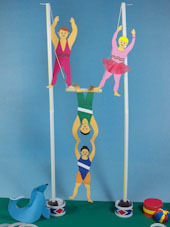 Choose the trapeze artists you want to make. Download and print the pattern. There are trapeze performers in tights or shorts and, for the most creativity, a blank pattern. Print the patterns on white paper. Color the performers on the black & white patterns with crayons or markers. 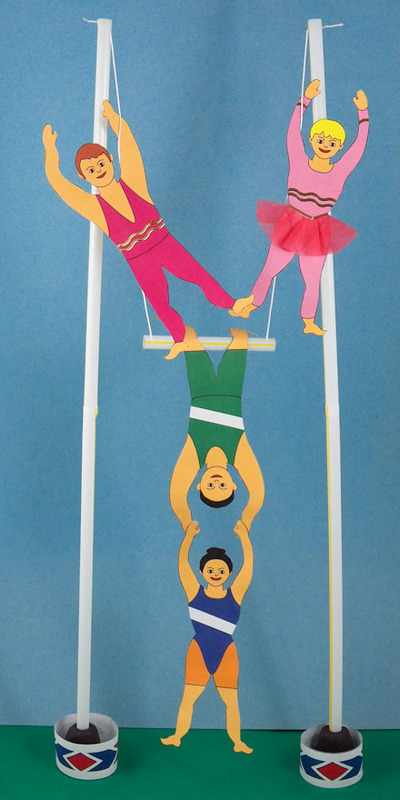 Cut on the box (rectangular) outline around each set of trapeze artists—front and back. Make the cuts straight and the corners square. Tip: The front and back of each performer are glued together. Cutting the surrounding box and then folding it makes it easier to align the performer's front and back. Place the cutout rectangle face-down. Fold the rectangle in half on the dashed line, matching corners and sides. For the best results, fold exactly on the dashed line. Glue the front and back together. After the glue has dried, cut out the trapeze artist, from the front, on the black outline. The back of the performer is a bit larger in order to accommodate a small amount of misalignment. Add decorations to the costumes, if you want. Design your own cutouts, use stickers, stamps or stencils, or color with markers or crayons. Star stickers are an easy way to decorate the costumes. Or, you might cut a strip of white paper to use as a stripe. Glue the white paper strip on the performer, then cut away the excess paper. 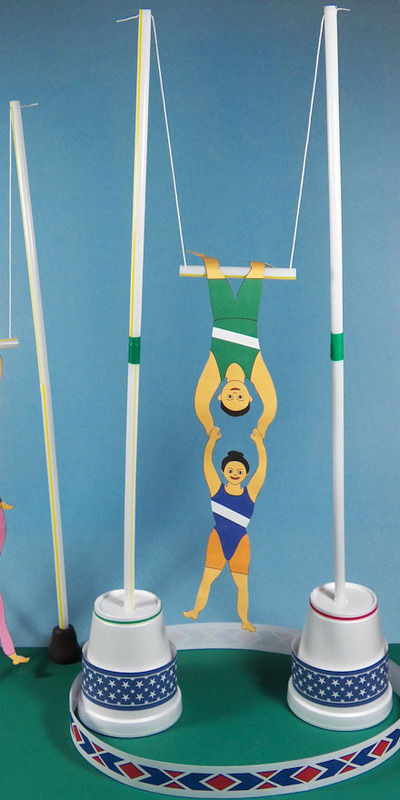 Make one or two trapeze stands for your trapeze act. For each trapeze stand, you need two 1" balls of clay, four straws, and two 8" lengths of string. You will also need one additional straw for the trapeze bars. Each pole is made of two straws connected end-to-end and stuck in a ball of clay. Base poles: Shape the balls of clay into cones and stick a straw into the center of each one. Make two ¼" snips opposite of each other in the top of each straw. Trapeze bar: Cut a 3" length of straw to use as a trapeze bar. Make a ¼" snip on both ends. Tie a knot near the end of two pieces of string. Put a knotted end through each slot and pull tight. Top poles: Make two ¼" snips opposite each other in one end of two straws. Hang the trapeze bar from these slots by slipping the strings through the slots. Adjust the string so the bar is even. 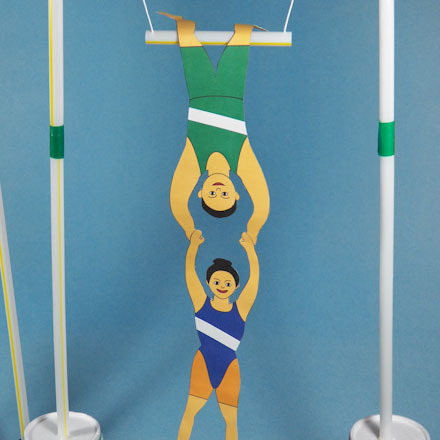 If you make two trapeze stands, place the stands 6" to 12" apart. Put one or two performers on each trapeze bar. You can join two performers together by gluing hands to hands, feet to feet, or hands to feet. Attach the performers to the bar by gluing the hands or feet to the bar, or by bending at the knees and hanging over the bar. Use your imagination and create something unique. Tip: You may want to make a Circus Ring for your trapeze act—the third ring of your three-ring circus. To make the other circus rings and the ringmaster, see the Under the Big Top craft series. That's it! You are done with the trapeze act! Tip: The base of each trapeze pole is a 1" ball of clay shaped into a cone. Press the cone firmly down onto the tabletop for a stable base. Tip: A Styrofoam cup can be used as the base for the trapeze poles. This type of base works better on carpet or rugs. Use a pen or pencil to punch a hole in the bottom of the cup. Slip the straw into the hole and use glue or clay to secure the straw. Place a small plastic bag of rice or dried beans under each cup for added stability. Decorate the cups as you like. Tip: Decorate the trapeze artist's costumes as you like. Gold stickers make nice additions, and a skirt made of netting or tissue paper is pretty. Tip: For a more stable trapeze pole, wrap the joint between the two straws with tape. Colored electrical tape works well. Tip: Make two sets of trapeze performers for your trapeze act. Use rings of circus ribbon around the pole bases.